Straight out of 1978, when the world was full of those women's lib-ers who went to work in pantyhose -- remember those days? I do -- and we feared we'd our landfills would burst, comes this craft book to save the day. 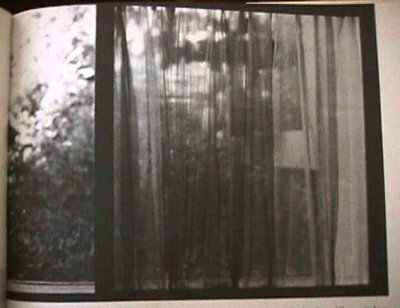 This next one is a window treatment, like curtains. 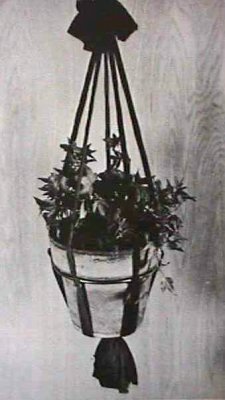 You hung yourself or a spouse in the hammock, so why not hang a plant next? Take a break from macrame, and make a hanging plant holder out of pantyhose! 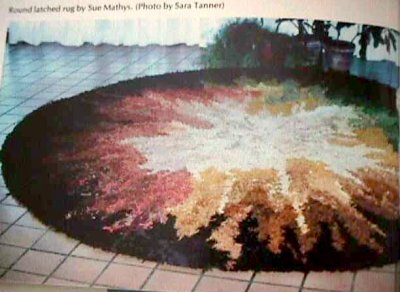 Here's a rug to crochet. 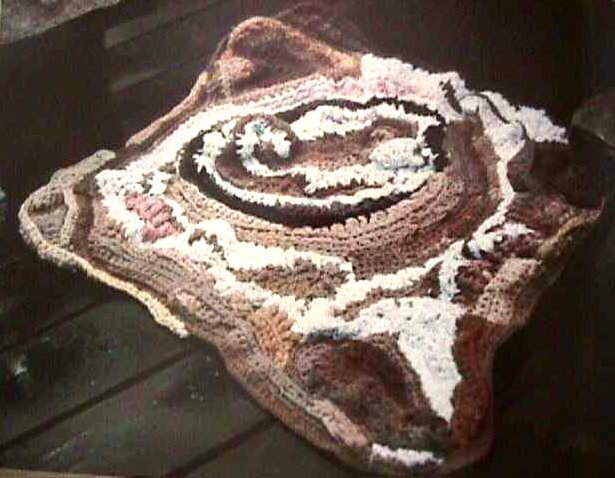 Both rugs look rather cool to me, but I wonder how they feel on your footsies... And for some reason I imagine them rolling & bunching up rather than laying flat. Oiy, pantyhose! There are lots of funny faces you can make with old nylons -- and not by pulling them on over your face either. 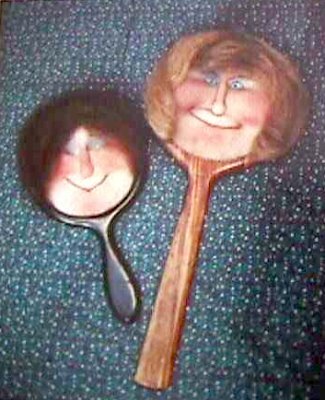 You can put them on the backs of mirrors (and scare the crap out of yourself in the morning when you look into the wrong side). 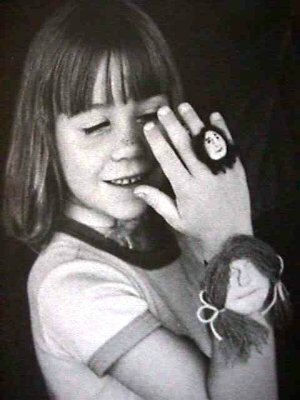 Who wouldn't want to wear a large creepy face on both their wrist and their hand? Well, kids will be kids you know. And hey, this is a kitschy 70's book, what did you expect? But in case you should run out of places to glue and stick faces, you can just stick them anywhere -- like shoes. 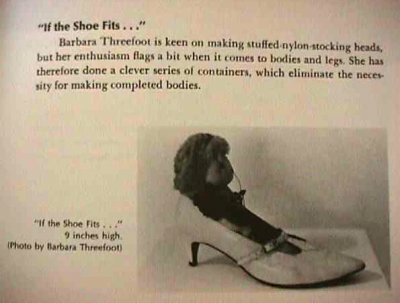 According to the book, the artist's name is Barbara Threefoot (so I guess she always has to buy two pairs, and needed something to do with those extra shoes), and she is "keen on making stuffed-nylon head, but her enthusiasm flags a bit when it comes to bodies and legs. She has therefore done a clever series of containers, which eliminates the necessity for making completed bodies." Another simple thrift shoppe find, well worth the $3.99 -- I'd pay up to $6 for it. And I'll never look at those estate sales with bags of old stockings and nylons quite the same way again. Rating: 4 of 5 kitschy poodle heads. The Pantyhose Craft book can be found at Amazon and at eBay. 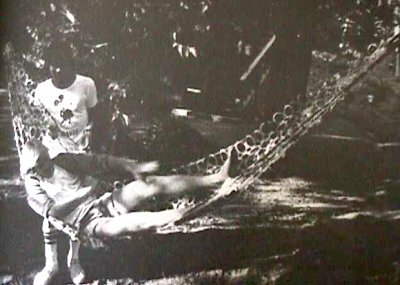 Jean Ray Laury is still alive and craftin'. Her website, jeanraylaury.com (a dizzying array of colors too vibrant to read from), appears to not have been updated since 2006 (admittedly not that long ago). 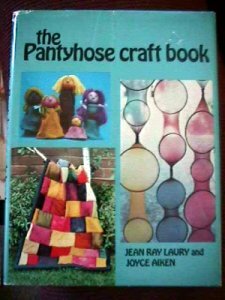 At her booksite she lists her other books, including three others co-authored with Aiken, but does not list The Pantyhose Craft Book. Someone else fancies Jean's craft books too. "Judy Chicago came to Fresno State College in 1970 to teach sculpture, and then taught women students here in the first feminist art class in the United States," she relates. 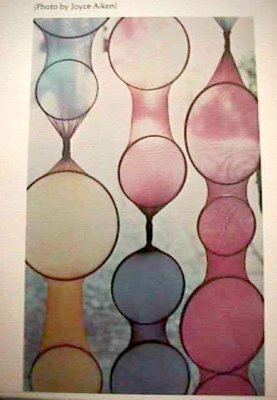 "Judy Chicago influenced me... she gave permission for women to use their own life experiences and materials--those traditionally used by women but not by men--in mainstream art. Judy Chicago brought out that women hadn't been given a voice." I guess the student took her lessons to heart and created The Pantyhose Craft Book out of her feminist mission allowing other women to use their own life experiences and materials to make art. Looked at that way, this book belongs in my collection of feminist works.